So Where Are You Taking That Bear? 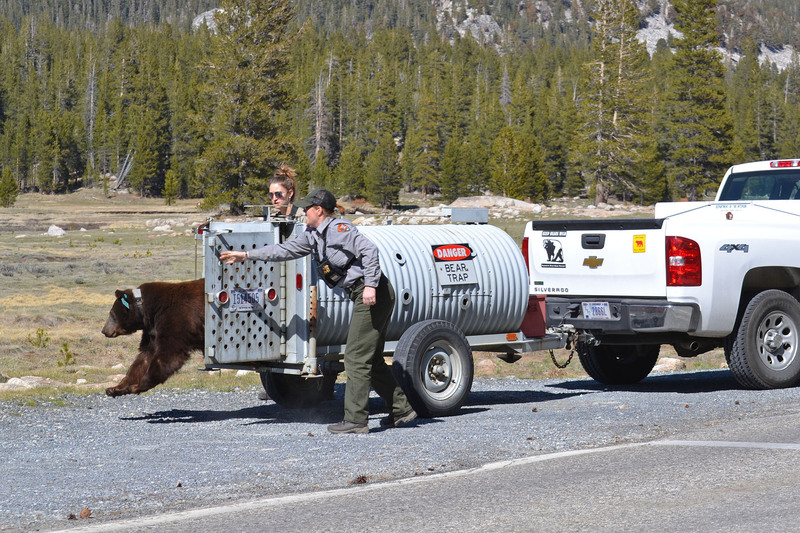 When visitors see us moving a bear trap in Yosemite National Park, they often ask: “So…where are you taking that bear?” When we discover a black bear obtaining human food and damaging property in Yosemite, we capture it to identify it and usually attach a tracking device. So, why then don’t we simply relocate the bear to a remote area of the park? Indeed, the National Park Service did that for many years. In recent years we’ve all but stopped this practice here. Why? It doesn’t work. Relocation implies that once moved the animal will stay put. There are several reasons moving bears doesn’t work. The most obvious — they usually return, often very quickly. For that reason we have adopted the term “translocation,” which implies that if you move a bear out of an area there is no guarantee it will stay put. More often than not translocation is nothing more than a temporary fix to a much larger problem. Sometimes bears don’t return home. In these cases it’s usually because they have found easy human food in another location (a nightmare for bear managers located hours away). In other cases bears may get hit by cars while trying to return home or may be chased off by other dominant bears already living in the area they were moved to. 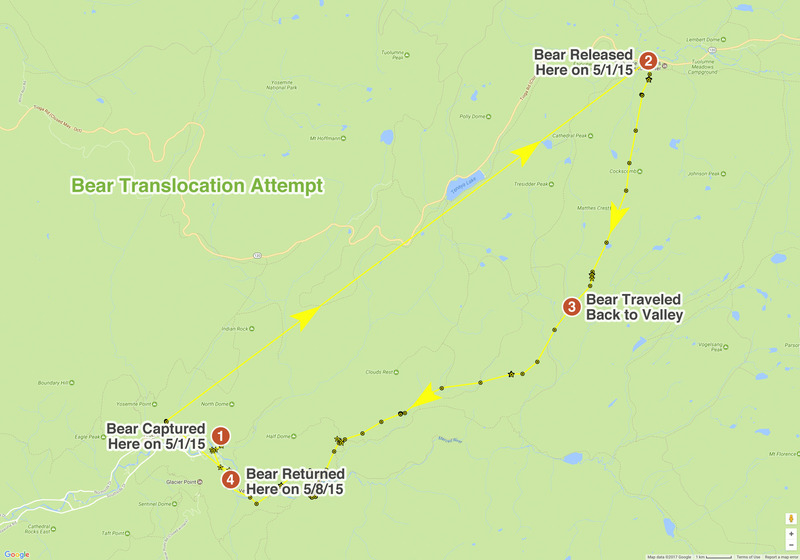 These bears could also chase off a less-dominant bear already living in that area. Simply put, moving bears into foreign locations, away from their home ranges and into those of other bears, can cause a negative domino effect. So what should Yosemite do when a bear starts investigating human food sources? Our focus is to prevent that animal from ever obtaining human food in the first place! The techniques wildlife biologists use to manage black bears are often ineffective as long as bears are able to access human food. It is the crux of human-bear conflict. It’s up to us to store food properly so bears and other animals can’t obtain it. If we all do our part, these animals can retain their natural avoidance of people and have the chance to live a long and wild life. After all, if bears can’t live in national parks, where can they live?